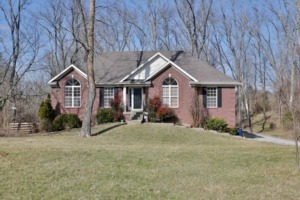 This stunning 3BR, 2 1/2 BA Ranch sits on over 1 acre in Kentucky Acres of Crestwood. The spacious GREAT ROOM includes a VAULTED, TREY CEILING, beautiful brick WOOD BURNING FIREPLACE & opens into both the EAT-IN KITCHEN & FORMAL DINING ROOM. From the Great Room you have access to the DECK with a beautiful view of the partially wooded, fenced-in backyard. The EAT-IN KITCHEN has beautiful natural light as well as great views of the backyard, neutral countertops & a convenient PANTRY. The FORMAL DINING ROOM has a VAULTED CEILING & CHAIR RAIL. Down the hall you'll find a FULL GUEST BATHROOM with EXTRA LONG VANITY & TWO GUEST BEDROOMS, one with a VAULTED CEILING. The large MASTER SUITE has a TREY CEILING & DOUBLE CLOSETS. The ATTACHED MASTER BATH has a separate water closet, DOUBLE VANITY, large JETTED TUB & SEPARATE SHOWER. The WALKOUT BASEMENT has a large FAMILY ROOM, HALF BATHROOM & an OFFICE or 4th BEDROOM (window but no closet). A 2 CAR, REAR ENTRY GARAGE & a 2-10 HOME WARRANTY offered by the seller complete this wonderful home. PLUS AWARD WINNING OLDHAM COUNTY SCHOOLS! Click to schedule your showing.